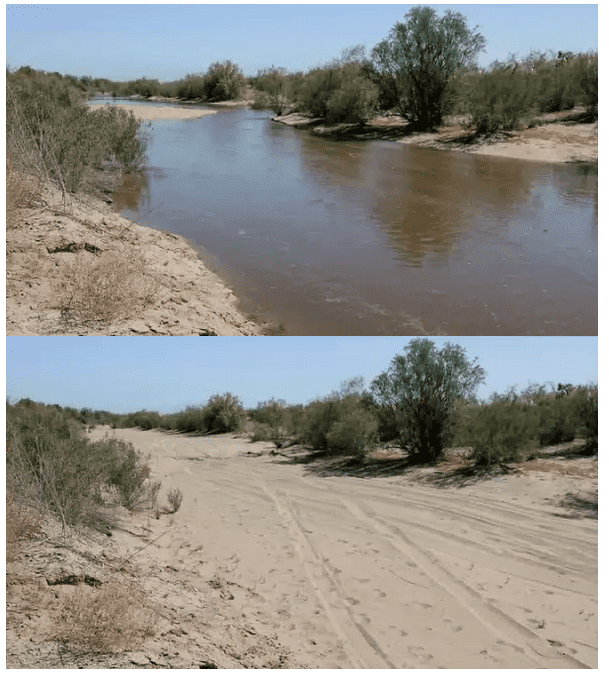 In March 2014, the US and Mexican governments decided to release a flow of water down the Colorado River, in an experimental attempt called “Minute 319”. The river has experienced record droughts in 2014, but surprisingly, this initiative reversed a 13-year decline in the greenness along the delta. After and before images. Image via NASA. The Colorado River stretches along 1,450-miles (2,330 km), encompassing seven US and two Mexican states. Known for its dramatic canyons and whitewater rapids, the Colorado river is also a vital source of water for agricultural and urban areas in the southwestern desert lands of North America. Recently, the river has been experiencing massive droughts due to over-utilization – 90% of the water is diverted in the US alone, not only for human and agricultural use, but also for electricity generation. Naturally, this over-usage has had a dramatic impact not only on the river itself, but also on the habitats it supports. 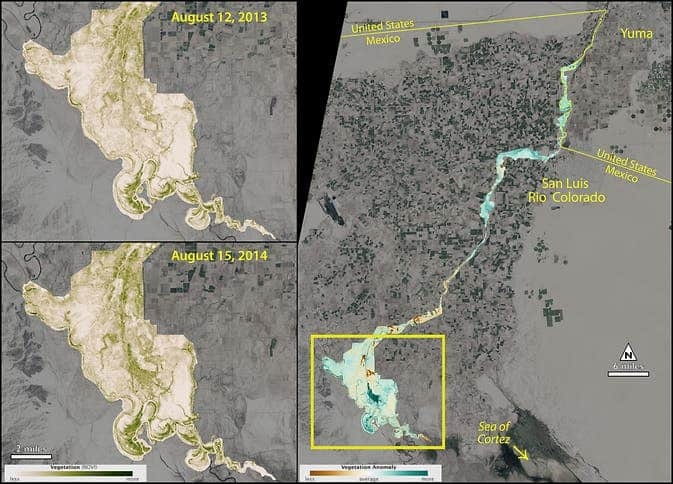 After the pulse flow, the lower Colorado River saw an increase in vegetation, as measured by the Normalized Difference Vegetation Index (NDVI) using Landsat 8 data. The left panel shows the NDVI before and after the pulse; the right panel shows the difference between the two measurements. When they compared the 2014 vegetation to the 2013 vegetation (prior to the pulse), the difference is huge – researchers calculated a 43 percent increase in green vegetation along the route wetted by the flow, called the inundation zone, and a 23 percent increase in greening of the riparian zone, or the river banks. These results were presented at the American Geophysical Union. “Data from Landsat and the MODIS sensor are well-suited to help people make informed policy decisions about ecosystem health, water management, agriculture and much more,” said Jim Irons, Landsat 8 project scientist at NASA’s Goddard Space Flight Center in Greenbelt, Maryland. “It’s especially gratifying to see these sensors help scientists evaluate several of those components in one project,” he said. Projects like this highlight the importance of having an archive of good Earth observations of the past to refer to, as well as comparable measurements into the future to measure how a policy changes the landscape. The fact that Minute 319 was successful is also a good sign. “It’s important to have continuity of the data, so that when a policy decision is made to release the water, we have a system in place to evaluate its effects,” he said. Remote sensing from satellites or technologies like LIDAR have revolutionized how we see the environment, and how we see the way we are impacting it. Basically, it allows us to view these things in a new way. Other applications that this technology could have just for river monitoring includes detecting changes in the river channel, surface water, groundwater, plant growth, and habitat for resident marsh birds and migratory birds. The project is also a reminder that different countries and organizations can and should work together when it comes to solving a problem which affects all the parties involved. Authorities are also considering repeating the experiment once more.